Click on any of the titles below to view PDF forms, instructions and diagrams. Click here for SPACING INSTRUCTIONS! 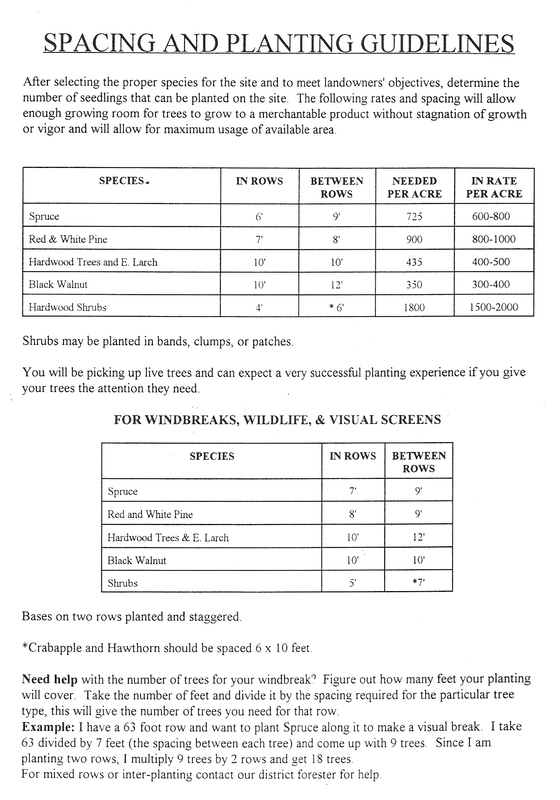 This is helpful to determine how many trees you would like to order based on use and type of trees. Congratulations in purchasing trees at the Clare Conservation District annual spring tree sale! Proceeds help fund conservation district activities. Trees provide a lifetime of benefit by giving shade, food, wildlife habitat and many other services. Make sure that the tree is suited to the site that you want to plant. This is an important step in the trees life. Consider the mature size of your tree. Watch out for overhead and underground power lines, septic tanks or housing foundations. Make that spacing will be appropriate. Trees and shrubs prefer specific growing conditions, so make sure you plant in the best spot. 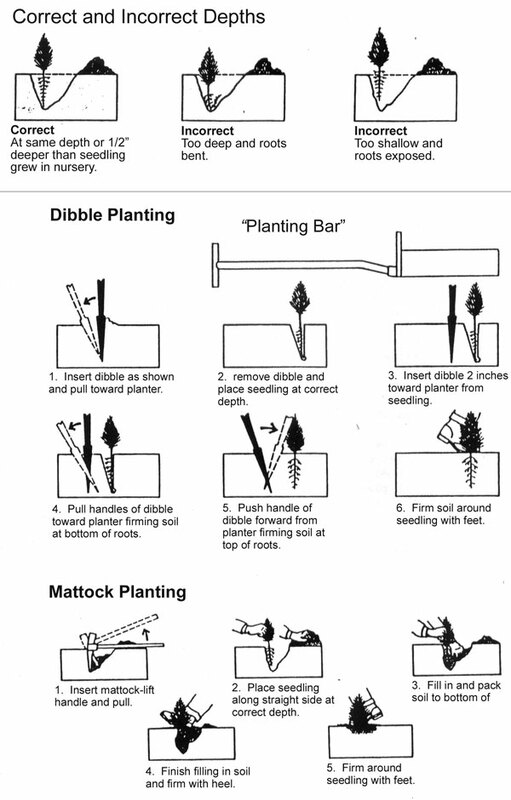 Loosening the soil where you plan to plant will help the roots grow. It is best to plant as soon as possible after receiving trees. Do not let roots dry out!! Store plants in cool, shady area, such as a garage or basement. If you cannot plant within a few days, you may "heel in" the trees. To do this, dig a trench in a cool, shady area. Lay the trees down on the uphill side and cover roots loosely with dirt. Thoroughly wet the soil to ensure the roots stay moist. If the trees are kept moist and planted promptly you may not need to soak the roots in water before planting. If you see that your tree or shrub's buds are beginning to swell or have broken open, this means it has broken dormancy. It should be planted immediately. Watering may be necessary for the first few years until trees become established. This is especially important for trees on dry sites. Once planted, give the trees a good watering. Take care to avoid over watering since trees take up oxygen through their roots. Too much water is just as bad as not enough. Mulching around the base of the tree will help keep it cool and retain moisture in the summer. Planting trees that are adapted to your property will ensure that minimal care is needed. It is very important to protect young trees from hungry animals! Even though you may be planting that Whitney crabapple for wildlife, a hungry deer won't wait to eat the apples. Wire mesh cages can be placed around the tree to prevent browsing. For conifer seedlings, buds can be capped by stapling folded paper over the top bud (do not staple through the tree). Plastic tree protectors can also be purchased through the Clare Conservation District. Moist soils, Does not like wet soils.